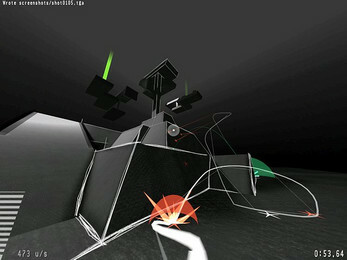 Purity was an abstract first person game in which each "weapon" was also a trickjump-style movement tool. I built it using ioquake3 from late 2007 to the IGF submission deadline in 2008. Shortly after I abandoned the project due to increasing work commitments and uncertainty about how to move the project forward. I still think some of these ideas are cool and might return to it someday. Til then, feel free to check out the build I submitted to the IGF. The source code is also available, though I haven't tried to compile it in a long time and the version of ioq3 it used is almost 10 years out of date as of this writing.